RESEARCH. Stakeholder Interviews. Brand & Business Audit. Competitive Analysis. IDENTITY. Naming & Tagline. Logo Design. Stationery. DIGITAL. Web Design & Build. Search Optimization. EXPRESSION. Collateral. Integrated Communications. Zerodha is a revolutionary online trading solution designed to allow active traders to buy and sell financial instruments such as stocks and mutual funds with a first of its kind, low cost, brokerage-free model. By eliminating commissions levied by trading firms, their brand vision lies in creating a brokerage-free world. 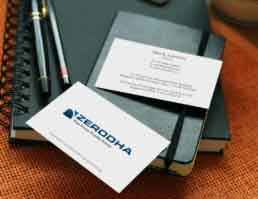 Zerodha needed a comprehensive brand identity programme to be created and activated in order to launch the brand nationally in just under two months. 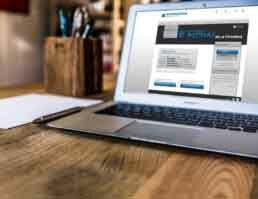 This not only included the name, tagline, logo, website and digital communications, but also a viable and distinct go-to-market brand strategy that would highlight its unique, low-cost offering. We researched the world of online trading and the prevalent branding practices in use before going on to create a distinct name by fusing the English word ‘Zero’ and the Sanskrit word ‘Rodha’ meaning barrier. We decided on ‘The Free Trade Zone’ as the tagline as it conveys the brand’s primary differentiator of brokerage-free trading in clever fashion. We created a logo comprised of a zero set in block format and stylistically cropped to create the impression of an upward pointing arrow, indicative of the trajectory of success investors can expect trading via Zerodha. Next we created the entire consumer experience for the brand by conceptualizing, designing and developing the website. Our work extended to developing key collateral and communications including business cards, envelopes, letterheads, direct mailers, outdoor advertising and much more to increase brand visibility and presence. Just one year since its launch Zerodha registered over 10,000 users. A cohesive and structured brand strategy has been immensely important in propelling the brand towards such rapid growth.